On October 2007, on the eve of the “Great Recession”, in a Conference at the Federal Reserve Bank of Dallas – The Taylor Rule and the Transformation of Monetary Policy – Bernanke spoke on the underpinnings of the “Great Moderation”, implying that policymakers had got the “hang of it”. According to Bernanke, during the 1960s and 1970s, monetary policymakers systematically overestimated the amount of slack in the economy and tended to attribute upward movements in inflation to “cost-push” shocks rather than to policymakers own attempts to achieve and maintain artificially low rates of unemployment. Bernanke notes that in studies that ignore the effects of expected future policy on inflation behavior, it has appeared that the shocks hitting the economy during the pre-Volcker period were unusually large; with these studies in fact mistakenly attributing the effects of bad policy to the shock process itself. We now know that Bernanke and the Fed did not fare well. Interestingly, a large part of the reason is that Bernanke did not heed his own ‘advice’. I put up three panels. 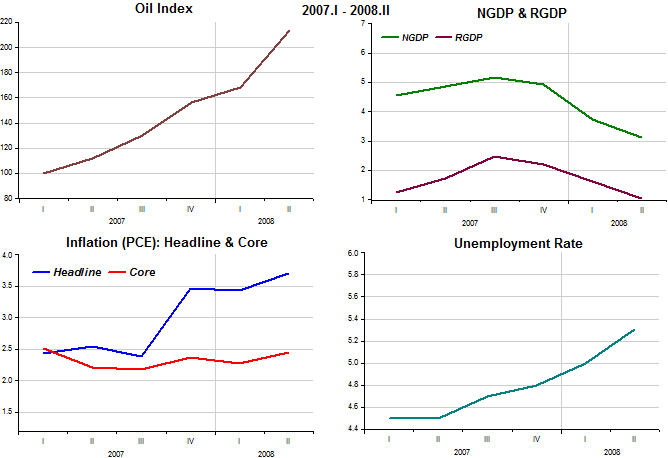 The first (the ‘control’), illustrates the situation during the oil shock of 2003-05, under Greenspan. 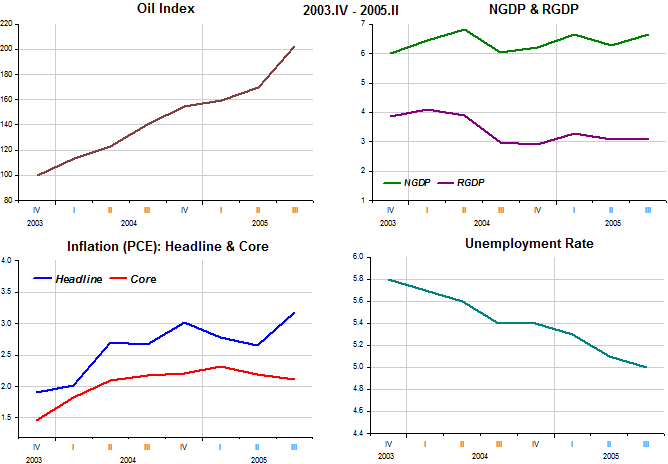 The second shows what transpired during the 2007-08 oil shock, under Bernanke. The third illustrates the ‘aftermath’. 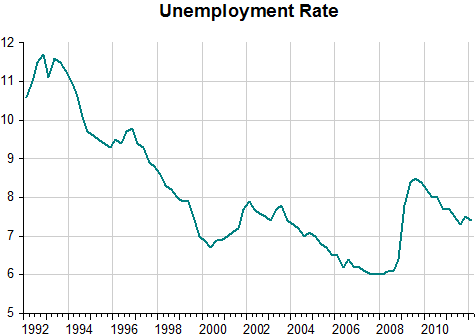 While unemployment is falling in 2003-05 it rises strongly (from a low level) in 2007-08. The aftermath is ‘shocking’. Aggregate world demand dries up so oil prices plunge. In the US the Fed allows nominal spending to take the biggest dive since 1938 bringing real output down with it. That is the quintessential example of an AD shock. 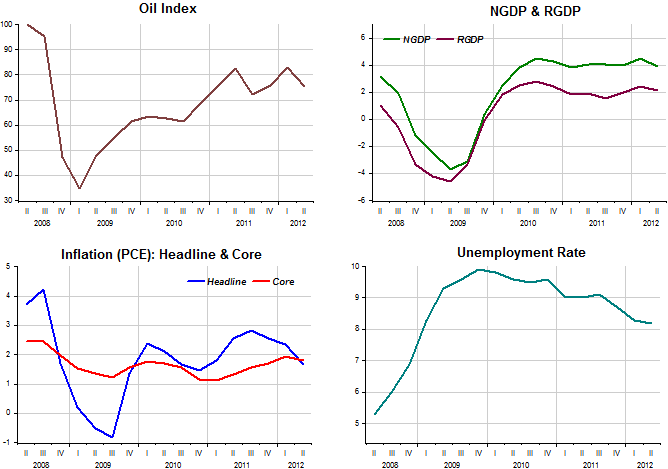 Headline inflation ‘dances in step with oil prices’ while core inflation remains subdued. Unemployment shoots up. All in all a huge disaster. What were Bernanke and the Fed doing? Likely paying undue attention to headline inflation, forgetting what Bernanke said about “the transitory and small impact on inflation” of real shocks. While in the old days the obsession was with unemployment, in the age of inflation targeting the obsession is with inflation. 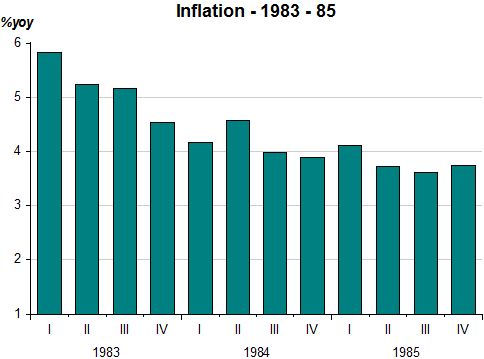 While in the old days inflation was a consequence of ‘misreading’ the amount of slack in the economy, in the age of inflation targeting the high unemployment is a consequence of ‘misreading the amount of inflation’. Remembering the shocks of the 70s and wanting to avoid a repeat, it got its ‘mirror image’! 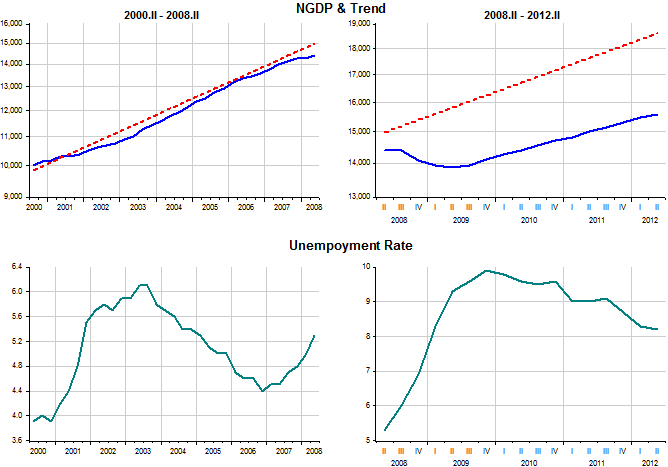 The fourth panel helps to understand the robust growth in nominal spending in 2003-05. It also illustrates very clearly the unemployment consequences of deviating and more recently ‘unmooring’ the economy from the “Great Moderation” NGDP trend, estimated for the period 1987-97 and extended to the present. 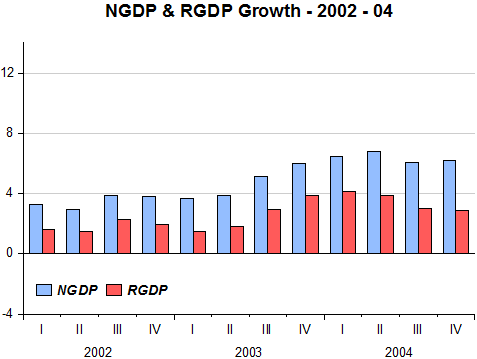 Looking back at the first panel, the high growth of NGDP in 2003-05 reflects the ‘catch-up’ to the trend level. With spending being below the trend, the only way it can get back to it is if it grows above the trend growth for a period of time. It essentially did so by the end of Greenspan´s tenure. Note that the simultaneous occurrence of strong nominal spending growth and rising oil prices did not let the ‘core inflation genie’ out of the bottle! It appears that Bernanke never paid much attention to where spending was relative to its trend, because soon nominal spending began deviating below trend. And when the FOMCs concern for inflation heated up in early 2008 spending growth began to decrease further plunging in the second half of the year. Again, Bernanke forgets his own ‘counsel’: if we ignore the effects of expected future policy on inflation behavior… remains valid if we substitute ‘spending behavior’ for inflation behavior. And no one doubted, given Fed ‘credibility’, that policy would be tailored to bring spending down. In January 2000, long before even becoming a Fed Governor, Bernanke wrote “What happens when Greenspan is gone”. His answer is far removed from his accomplishment. Another reminder of Thomas Malthus! FT/Alphaville has an interesting compilation of the NYT archives from the 1930s. I selected these two because they come on the heals of FDR´s delinking from gold expansionary monetary policy. Belief in government bonds, joined with expectation of debasement of the dollar, does not seem logical. For that matter, artificial restrictions of production and wages do not seem logical. Government intervention in commodity markets does not seem logical. Perhaps we must assume that national emergency transcends logic as well as law. The avowed plans of extreme inflationists would give United States bonds, I suppose, the same value as cash. If sufficient inflation with greenbacks occurs, or if, as we produce more and more goods, the dollar is correspondingly debased, “Investor” may anticipate, I believe, the destruction of almost all investors and of savings. That is, to the ineffectiveness of monetary policy at present. There are those, like Plosser, who believe this is unconditionally true, and there are those, like Michael Bordo, who praise the power of monetary policy, arguing, against the conventional wisdom, that historically it has been even more effective following financial crisis but conclude that “this time it´s (really) different”. There’s a belief among policy makers that serious recessions associated with financial crises are necessarily followed by slow recoveries—like the one we’ve experienced since mid-2009. But this widespread belief is mistaken. To the contrary, U.S. business cycles going back more than a century show that deep recessions accompanied by financial crises are almost always followed by rapid recoveries. The mistaken view comes largely from the 2009 book “This Time Is Different,” by economists Carmen Reinhart and Kenneth Rogoff, and other studies based on the experience of several countries in recent decades. The problem with these studies is that they lump together countries with diverse institutions, financial structures and economic policies. They also conflate two different measures of speed—how long it takes a country to get back to its previous business-cycle peak, and how fast the economy grows once the recovery has started. Milton Friedman had a different way of looking at recoveries from cyclical downturns: the “plucking” model. Friedman imagined the U.S. economy as a string attached to an upward sloping board, with the board representing the underlying long-run growth rate. 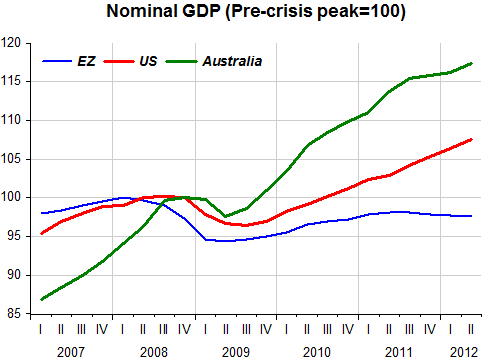 A recession, in this view, was a downward pluck on the string; the recovery was when the string snapped back. The greater the pluck, the faster the bounce back to trend. In a recent working paper for the National Bureau of Economic Research, Joseph Haubrich of the Federal Reserve Bank of Cleveland and I examined U.S. business cycles from 1880 to the present. Our study not only confirms Friedman’s plucking model but also shows that deep recessions associated with financial crises recover at a faster pace than deep recessions without them. Thus the slow recovery that we are experiencing from the recession that ended in July 2009 is an exception to the historical pattern. This can largely be attributed to the unprecedented housing bust, a proximate measure of which is the collapse of residential investment, which still is far below its historic pattern during recoveries. Another problem may be uncertainty over changes in fiscal and regulatory policy, or over structural change in the economy. The legacy of the unprecedented housing bust calls into question whether in the future, expansionary monetary policy could make recoveries more consistent with the depth of recessions. Expansionary monetary policy(!) in the past three years seems to have had only limited traction in stimulating the economy and speeding housing recovery. To catalyze full recovery in housing, we may need policies other than looser monetary policy. Mr. Plosser said the best strategy for the Fed right now is simply to step aside. “It doesn’t surprise me things look kind of bad right now,” Mr. Plosser said. “I don’t think that’s going to change dramatically over the next three or four months,” he said. When it comes to the outlook, “I don’t think that monetary policy will be particularly determinant” in what happens, Mr. Plosser said. St. Peter is heaven´s “weather controller”. But he must be angry at our policymakers because he “blew” a drought that dragged down spring RGDP, which was revised down in this third and final estimate. The Fed remains quite unhelpful, different from what went on after other recessions. The charts show year on year growth of both nominal spending (NGDP) and real output (RGDP) during the first 12 quarters of expansions. 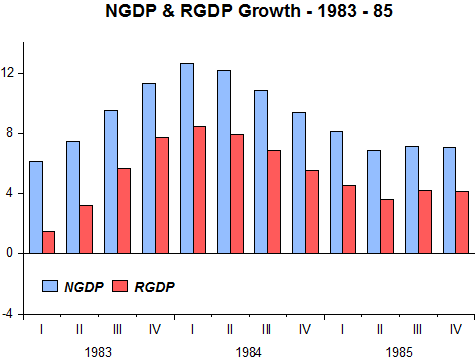 Remember that the 1981-82 recession was deep, justifying the large rebound in nominal spending that drove RGDP forward. The 2001 recession was, on the other hand, very short and shallow, but even so the Fed was stingy and took it´s time in promoting an increase in nominal spending. The effects were seen in the protracted recovery in employment (the ‘jobless recovery’). In the present case the Fed has been outright miserly and nominal spending – which fell markedly in 2008-09 – is growing at an even lower pace than before the crisis hit, with the first quarter of “expansion” registering a significant fall. In other words, the “hole” is not being “filled” and in that case employment opportunities remain scarce. 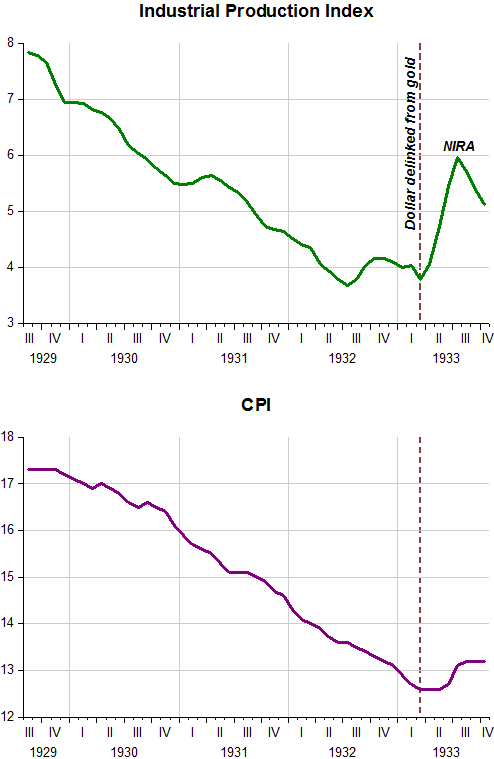 And for those who think a higher growth in nominal spending is a harbinger of “running out of control” inflation, below the corresponding charts. 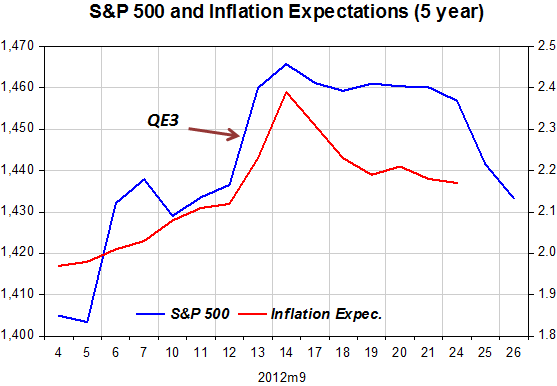 On the wake of the QE3 announcement stocks and inflation expectations jumped. But it was a short run move, with levels falling back to where they were just before the announcement. That´s maybe why Chicago Fed Charles Evans is “crying for more”. Mr. Bernanke, “when will you ever learn”? 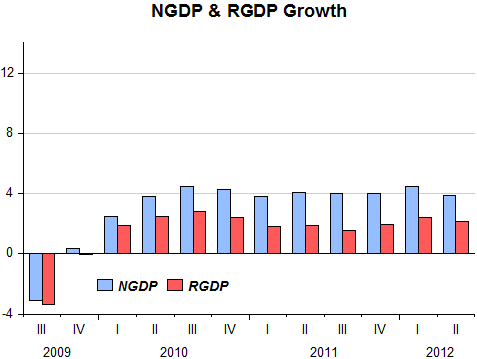 The previous two recessions saw small drops in NGDP growth, and slower than normal recoveries. So there’s really no big mystery to explain, except to the extent that productivity behaved abnormally. I’ll accept Berger’s claim that it did, but it really doesn’t explain much, at least in this recession. The unemployment rate is not surprisingly high, it’s surprisingly low given the sub-3% RGDP growth since unemployment peaked at 10%. Indeed it’s not clear why unemployment fell at all. (I’ve had posts called “our job-filled non-recovery.”) And in the 2001 recession unemployment peaked at 6.3%, which probably isn’t much above the natural rate. 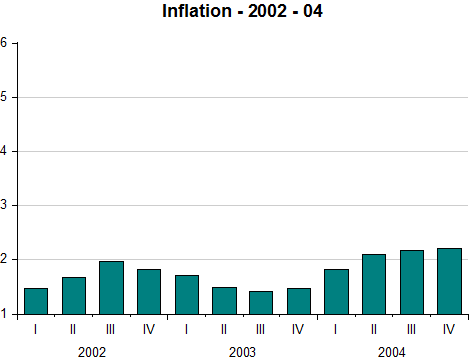 I wasn’t complaining about tight money in 2001, it’s the recent recession that is the outlier. Yes, there´s really no big mystery to explain (and ignore productivity behavior). 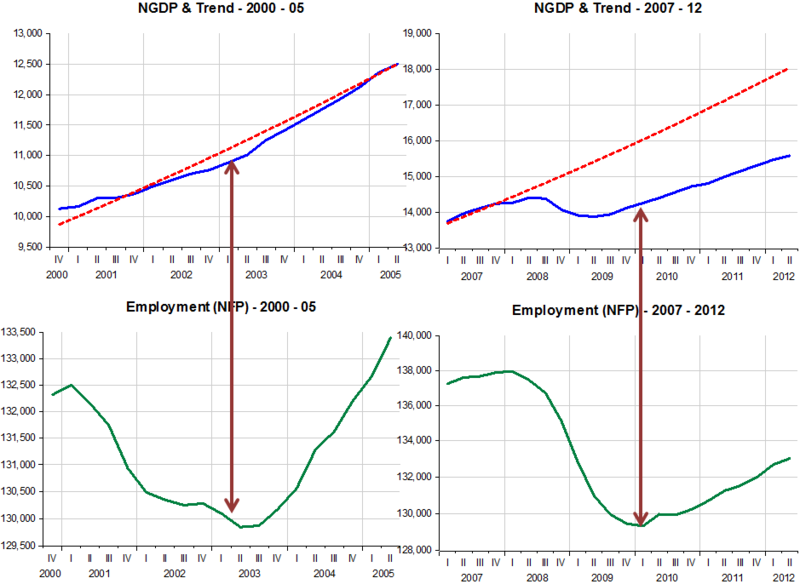 The employment recovery from the 2001 – so called jobless recovery – was the direct outcome of the slow NGDP recovery to trend. But when it did start the voyage back to trend in 2003, employment did well. And I find it interesting that even some market monetarists insist on the idea that monetary policy was “too easy” in 2002-05 (with the FF rate staying “too low for too long”). Now compare that with what we observe today, based on the same trend line. If we´re back to the “long run”, it is indeed a quasi-quicksand muddy pool! Are we really stuck in a long run muddy pool? The Fed’s role can be viewed not as turning on the NGDP machine and creating more NGDP to distribute to private firms and households but as coordinating expectations across the private sector in order to arrive at a better equilibrium. If the Fed fails to play this coordinating role, the market may not be able to clear on its own. Firms are now building more and selling more, but we need them to build and sell a lotmore if the stock of unemployed workers is to return to normal levels. But right now, firms are doing the equivalent of standing around saying to each other, “Well, I’ll build a lot more if you buy a lot more”, “Well, I’ll buy a lot more, if you hire a lot more”, and around and around. The Fed can and should put out word that now is the time for everyone to take the leap. And this time around the distinction is crucial because the level drop was (almost) unheard of, at least by those still in their prime age. To say “ngdp is low,” or “ngdp is on a low growth path,” or “ngdp is below trend,” and so on — be very careful! Those claims do not necessarily have causal force. Arguably they are simply repeating, in a new and somewhat different language, the point that the private sector has not seen fit to engage in more trade, credit creation, velocity acceleration, and so on. Formally speaking, the claims are not wrong, but I don’t find them useful as an explanation for why economic growth or recovery, at some point in time, is slow. It is one way of repeating or re-expressing the slowness of economic growth, albeit with some transforms applied to the vocabulary of variables. I get nervous at how ngdp lumps together real and nominal in one variable, and I get nervous at how the passive voice is applied to ngdp. No, NGDP is *all* nominal. That’s why it has the “nominal” in front. 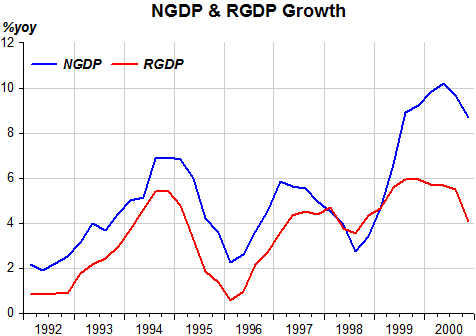 RGDP is an artificial concept requiring that we estimate an index of the aggregate price level. But we know, or should, that RGDP is the end game, the driver being aggregate spending, or NGDP, which throws out real output on the one hand and prices on the other. The more real output we get for a price level so much the better. 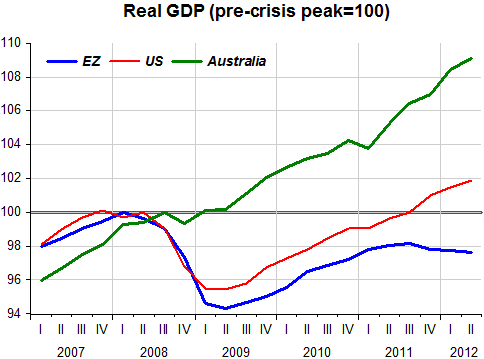 Why did the US generate more real output than the Eurozone? Logically, the US “drove aggregate spending” harder. 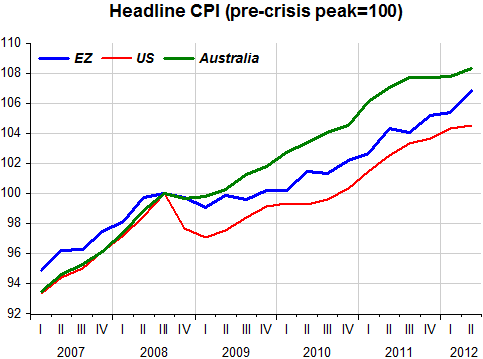 And, “magically”, prices in the US rose less than in the Eurozone. But then, take stock of what went on in Australia. 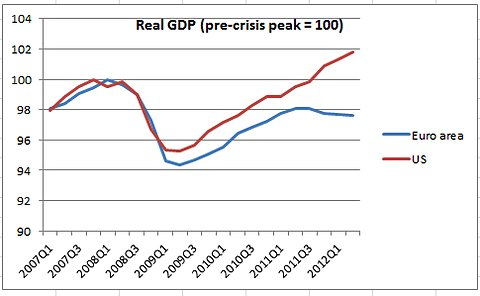 In terms of the end game – RGDP – it did best. 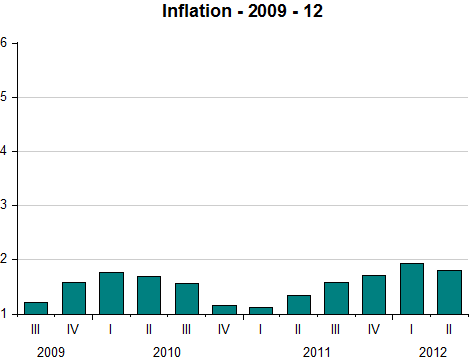 It also had the highest rise in prices (all headline consumer price indices). But wouldn´t that (rather small difference, after taking into account that Australia did not experience a fall in prices) be worth the gains in real income and employment? I bet the Aussies will say aye. Former Canadian Prime Minister Paul Martin has a stern warning for the U.S. political class: Get real about the gap between federal revenues and spending, or get ready for disaster. Mr. Martin knows of what he speaks. In 1993, when he was Canada’s finance minister, his country faced a daunting fiscal crisis. It wasn’t Greece, but by 1994 Canada’s federal debt-to-GDP ratio was getting close to 80%, and the cost of servicing the debt had begun to eat up an incredible one-third of government revenue. The central lesson from that crisis, Mr. Martin told an American Enterprise Institute audience in Washington last week, is that delay only ensures that the inevitable adjustment will be more painful. When the Liberal Party government of Prime Minister Jean Chrétien took power in October 1993, Mr. Martin was charged with pulling his nation out of the fiscal death spiral. He did it with deep cuts in federal spending over two years that amounted to 10% of the budget, excluding interest costs. Nothing was spared. Even federal transfers to the provinces to fund Canada’s sacred national health-care system got hit. The federal government also cut and block-granted money for welfare programs to the provinces, giving them almost full control over how the money would be spent. In the 1997 election, the Liberals increased their majority in parliament. The Chrétien government followed with tax cuts starting in 1998 and one of the largest tax cuts—both corporate and personal—in the history of the country in 2000. The Liberals won again in 2000. That certainly qualifies as a “fiscal cliff”. What happened to the economy? The charts illustrate. Nominal GDP (and Real GDP) faltered in late 1995 and early 1996, impacted by the draconian fiscal measures, but quickly roared back. Inflation (GDP deflator) was well behaved, tumbling in the wake of the Asia crisis which impacted oil (and commodity) prices. When oil prices picked up again inflation accelerated. But that was a reflection of a relative price change, which should not concern monetary policy. 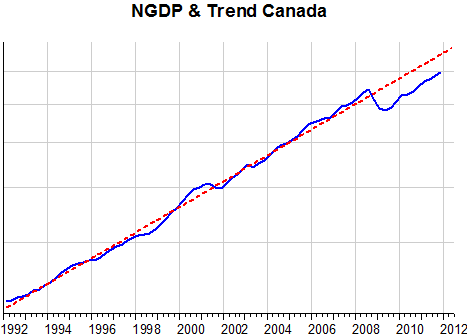 The main lesson from Canada´s successful fiscal adjustment is given in the next chart which shows that nominal spending (NGDP) was kept close to trend at all times. Like in almost every country, in the wake of the 2008-09 crisis Canada´s nominal spending faltered, but the resulting gap is much smaller than that observed in the US and most certainly much smaller than the one that afflicts the Eurozone countries. Unemployment fell throughout, going up at the start of the 2008-09 crisis, but falling back to levels experienced in 2004. Overall, either during the fiscal adjustment of the 90s, or following the 2008-09 crisis, not a bad comparative performance.